Without Fannie’s remarkable talent with needles, her intuition, her knowledge of nutrition and herbs, I would be stuck. Traditional medicine, visits to several doctors and specialists, left me without hope and without a plan to get better. Fannie has done what the ‘experts’ could not do and brought me back to a place of hope and health. Fannie is a nationally board-certified and state-licensed practitioner who specializes in the areas of acute and chronic myofascial pain conditions, women’s health (including fertility), and anxiety disorders. She has a strong interest in food cures and the topical use of Chinese herbs, which is evident in the prominent role of nutrition counseling in her practice and the creation of her own line of tendon and trauma liniments. Read about Fannie in her interview with Boston Voyager! Fannie’s passion for Eastern medicine can be traced back to her roots as a third-generation Chinese immigrant in the Philippines, where she grew up surrounded by food infused with herbal medicine thanks to her mother and grandmothers. She has spent a lifetime integrating the best of Eastern and Western cultures, and finally discovered that Chinese medicine provided a perfect home for her inquisitive mind and free spirit. Fannie lives in the Boston area with her husband and a fur baby. (Puppy therapy is always a negotiable part of treatment.) She enjoys good food, the company of friends and family, travel, and music. Nowadays, if she is not seeing patients, she is probably finishing a novel or looking for a cauldron and broomstick on Pottermore. Check/subscribe to her blog for regular updates on what she’s working on and tidbits related to Chinese medicine. 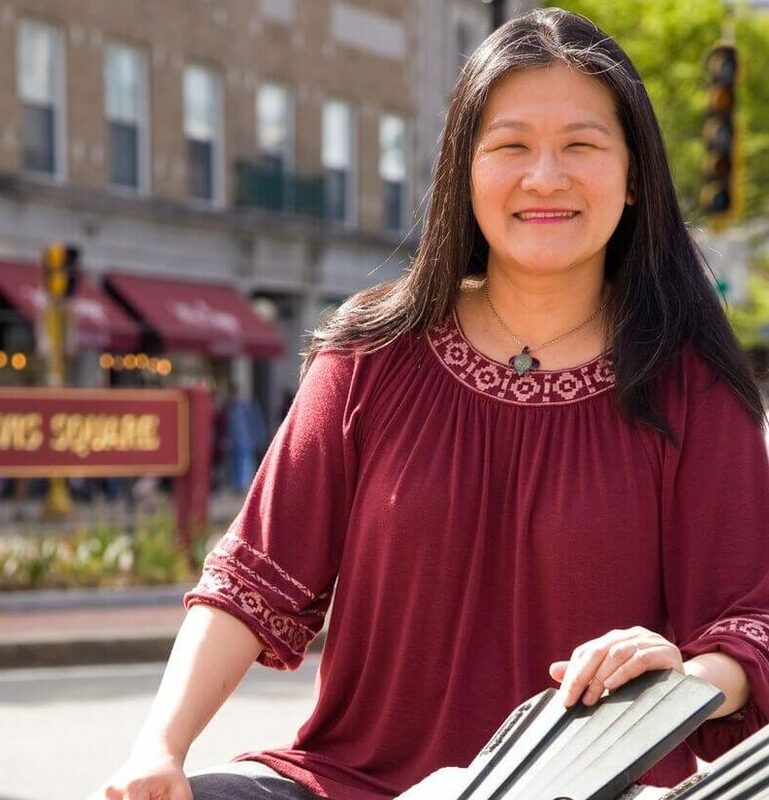 Fannie is a nationally certified acupuncturist and herbalist who practices at Davis Square Healing Arts, a community of independent health practitioners who share a space in Somerville’s bustling Davis Square. Before starting her own practice, Fannie was one of the acupuncturists/herbalists on staff at New England Community Acupuncture‘s North Andover clinic for nearly four years, where she saw an average of 30-40 patients per week. Fannie also worked for two years at 360 NeuroMuscular Therapy (360NMT) in Needham, MA where she received additional training in Trigger Point Therapy using bodywork and dry needling (through Myopain Seminars). The team at 360 NMT integrates trigger point deactivation techniques and advanced massage therapy to alleviate pain. Fannie graduated from New England School of Acupuncture (NESA), the oldest school of Oriental Medicine in the United States, where she completed over 3,000 hours of academic and clinical training. She is licensed by both the Massachusetts and New Hampshire Boards of Medicine and a Diplomate of Oriental Medicine with the NCCAOM. It all started with a pendant from a street festival: a glass sea turtle had caught my eye with its beautiful colors that changed playfully with the light. I wear it around my neck all the time and get so many compliments on it that it's amazing how long it took me to realize that it was the perfect spirit animal for my clinical practice. The turtle has always offered great symbolism for the practice of Chinese Medicine. It is patient, wise, and enjoys great longevity under the right circumstances. Chinese medicine is the same in that it plays the long game. It's about balancing the body and returning it to its natural state of health. You can't rush if you want to do it right, and once health issues resolve, they tend to stay stable for quite a long time. As to why the turtle is flying, I picture the giant sea turtles in the ocean and how fast they can swim. We have this impression that turtles are slow, but that’s because they are walking on land. In water, they move with a grace and speed that makes them look like they are flying. I also found my “ocean” when I found a career in Chinese medicine. It feels like this was what I was always meant to do. Here, I met my tribe. I had worked in consulting, travel, journalism, finance, and education, but none of those roles ever quite felt right until I worked as an acupuncturist. Coming to the clinic is like coming home - I find my center, I find peace, and I find joy! No matter what else is going on in my life, I can come back to the clinic, start seeing patients, and I will find myself. I imagine flying feels like this - natural, easy, as if I was born to do this. 2) Like turtles, you'll never get anywhere unless you stick your neck out. I really like the idea that we are, at the end of the day, self-sufficient. Everything we need to be and stay healthy lies within us. Our body knows what to do. It just needs to be free to calibrate itself into a state of health. Chinese medicine doesn't "cure" as much as it enables our bodies to heal. As for sticking (haha) your neck out, it's true that for most people, acupuncture is still an adventure into an exotic, mysterious medicine. I see it more as a journey that you, the patient, and I, the practitioner, undertake together. The question I get asked the most often is, will acupuncture work for me? And the answer is, you won't know until you try it because every person is different and responds in their own way, in their own time. The clinic is a healing space - a safe place for both my patients and I to heal, to grow, to discover, and to celebrate. I intend for Flying Turtle Healing Arts to be a haven for beginnings and endings, for people to reconnect with the miracle of their bodies and power of their intentions. It is my hope that we all find our wings together... and fly. New England School of Acupuncture.